You are currently browsing the tag archive for the ‘Rocky Point’ tag. 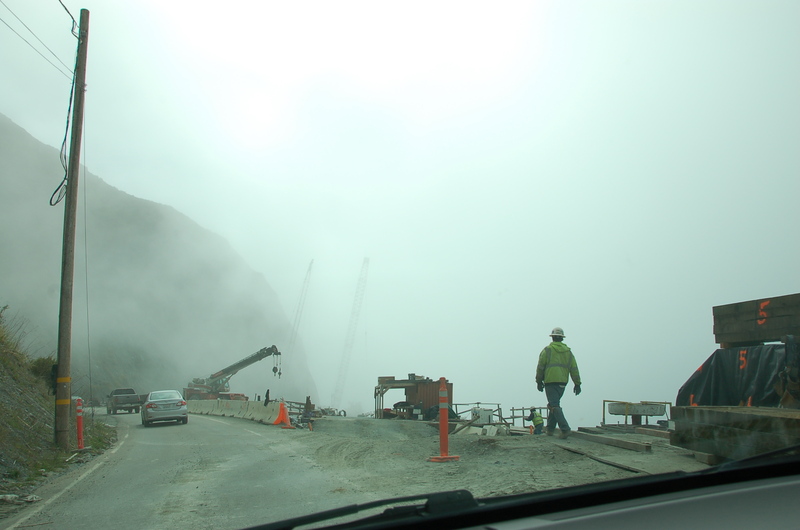 Two Caltrans projects halt cars on Highway 1 through Big Sur. 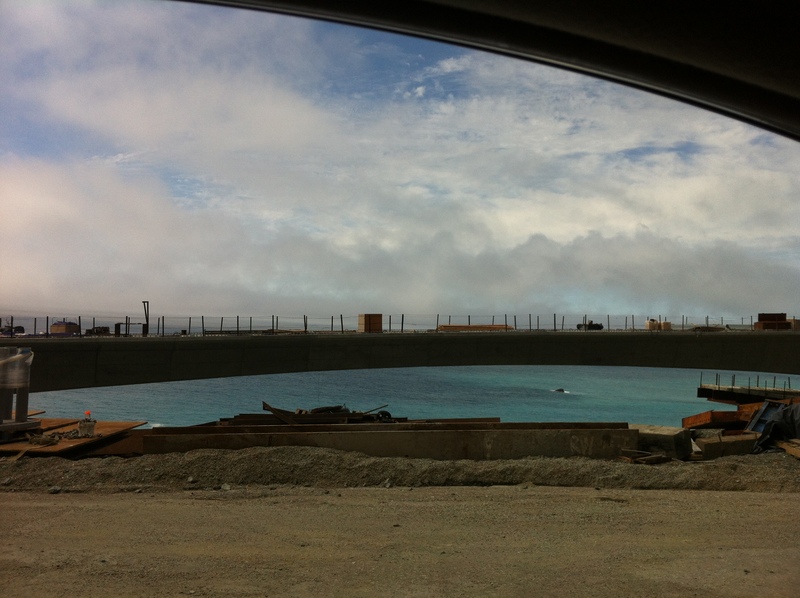 The northern one consists of maintenance and improvements at Rocky Creek Bridge. 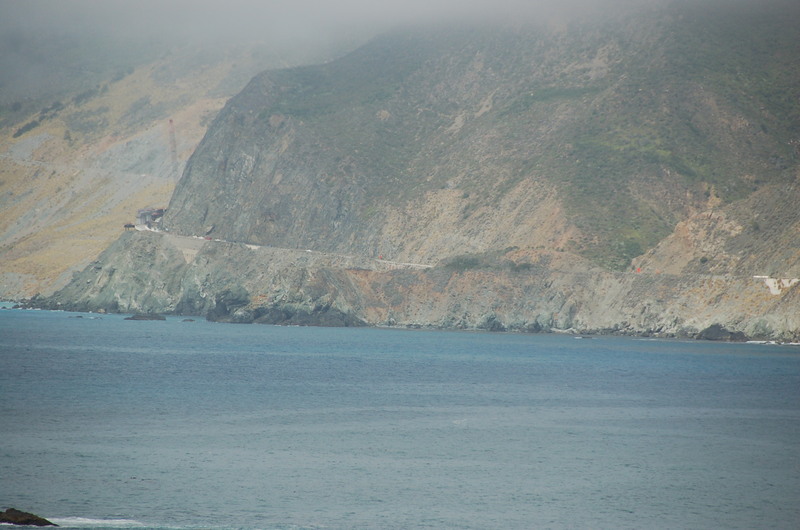 The southern project consists of two constructions, both well-coordinated to appear as one project; a bridge at Pitkins Curve and a rock shed at Rain Rocks. 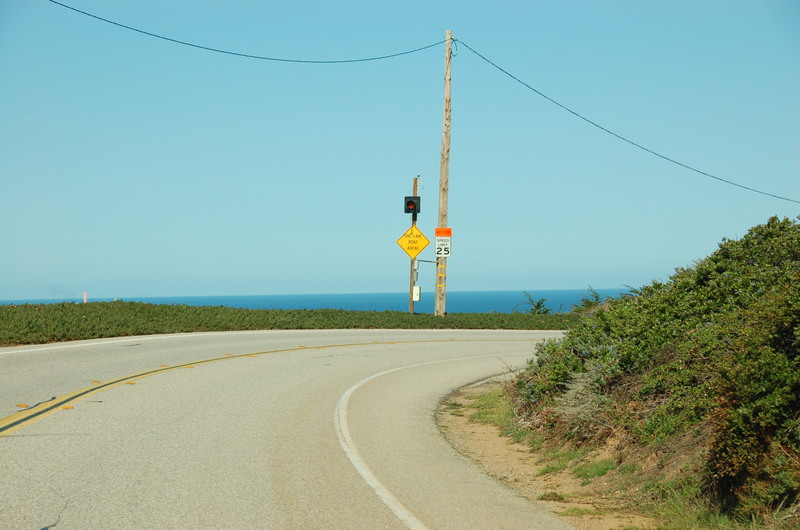 Along the northern Big Sur coast, about a 1/2 hour south of Carmel, automobiles and bicycles are controlled, by stoplight, to one-way passing on the northern and southern approaches to Rocky Creek Bridge. You’ll wait only a few minutes at the light while the opposing traffic clears, then be allowed to pass through. 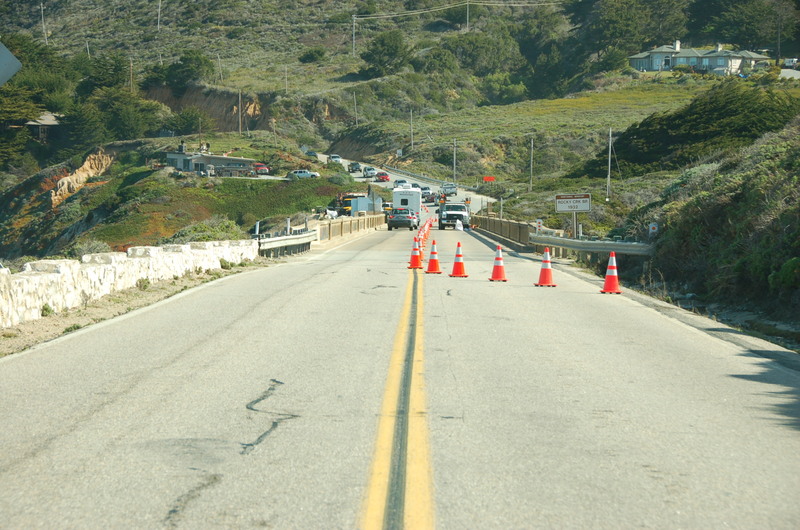 The Rocky Creek Bridge job isn’t listed (as of today) on CalTrans Road Conditions, but its roadwork is mentioned in a February 2012, District 5 Status of Projects. 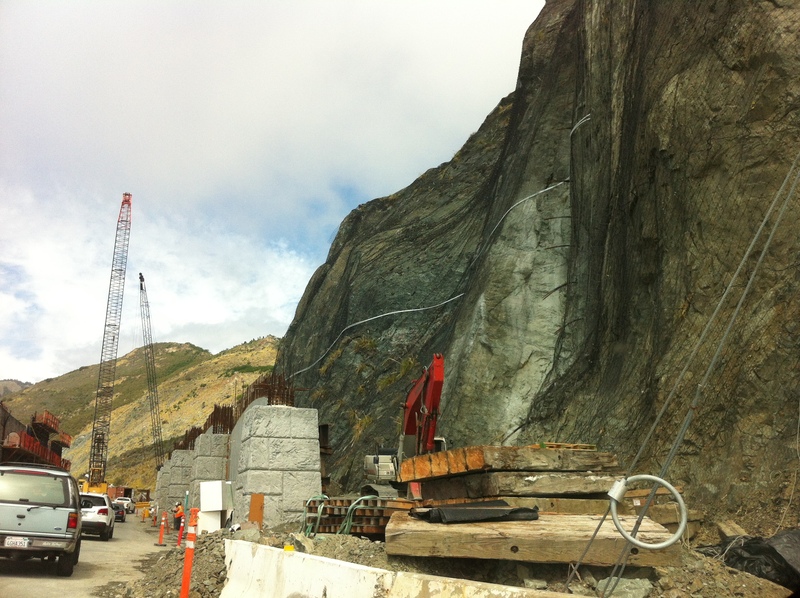 CalTrans is stabilizing the roadway, widening the shoulders, upgrading guardrails, and installing a retaining wall. 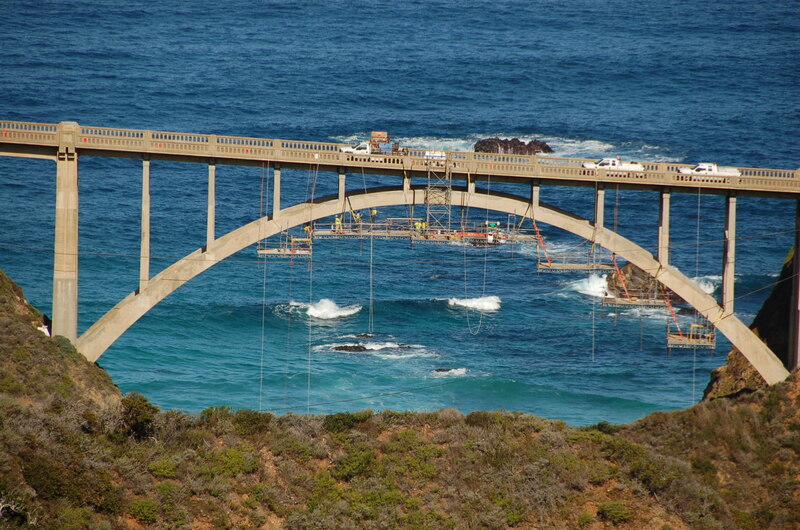 Judging by the multiple scaffolds, it appears that the bridge, built in 1932, is undergoing a multi-point inspection. You’ll wait about ten minutes at the site of Pitkins Curve and Rain Rocks, along the southern coast of Big Sur near Lucia. You can shut off your engine and relax, while listening to ocean breezes through your car’s open windows. Rain Rocks Rock Shed and Pitkins Curve Bridge is listed on CalTrans Road Conditions, but without any description of how amazing is this two-in-one project. Pitkins Bridge and Rain Rocks Rock Shed perch atop the shifting scree of greywacke within the narrowest construction jobsite ever visited. 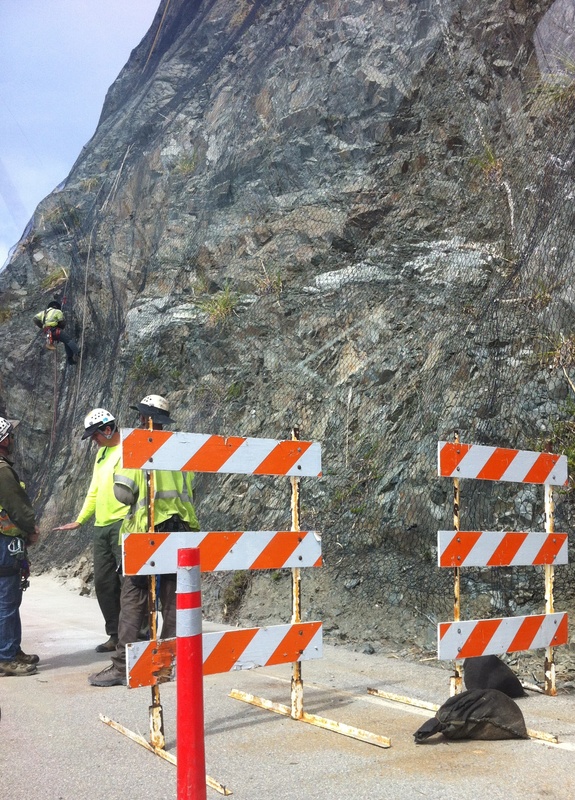 Steel netting is draped over the rockface to contain ceaseless falling rocks. The netting was initially draped with helicopter assistance, then climbers fasten it tightly in place. 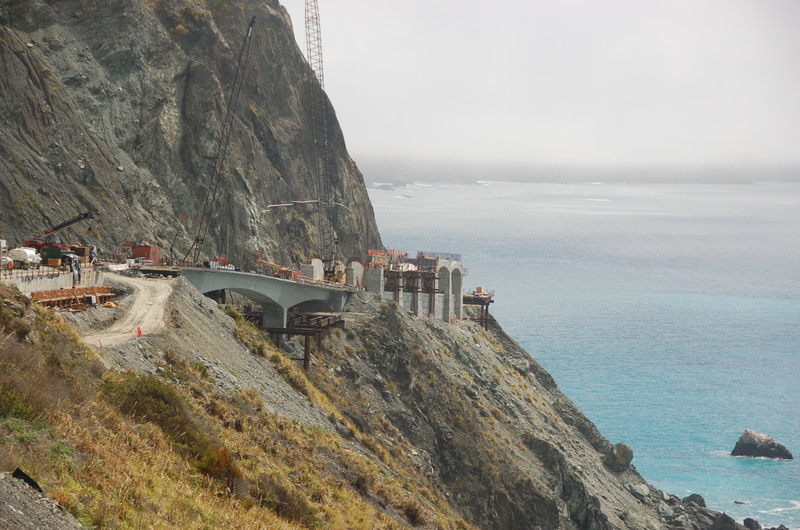 The rock shed will allow for cars and bicyclists to safely travel this passage and the bridge will connect the rock shed to the northern roadbed. Slow for the Cone Zone.